Here in New England, we’re still a few months away from seeing our own local blueberries at the market. 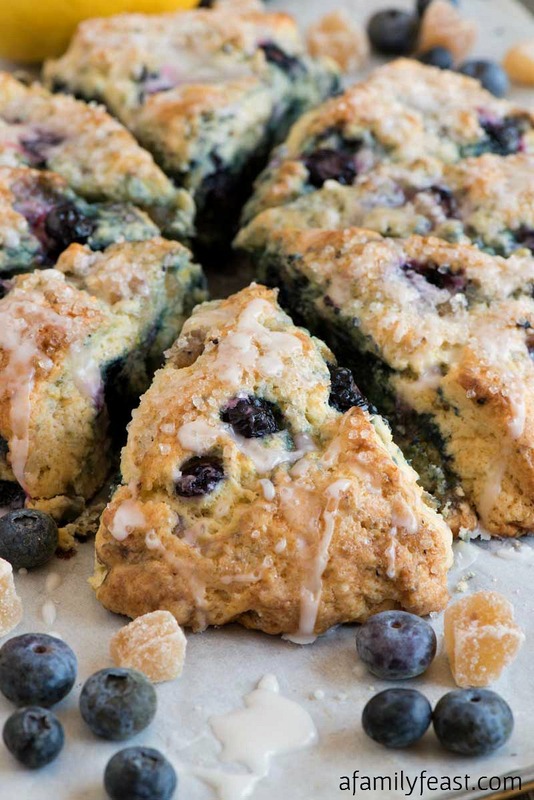 But with summer blueberry season already on my mind – I’m sharing these delicious Blueberry Ginger Lemon Scones with you today. 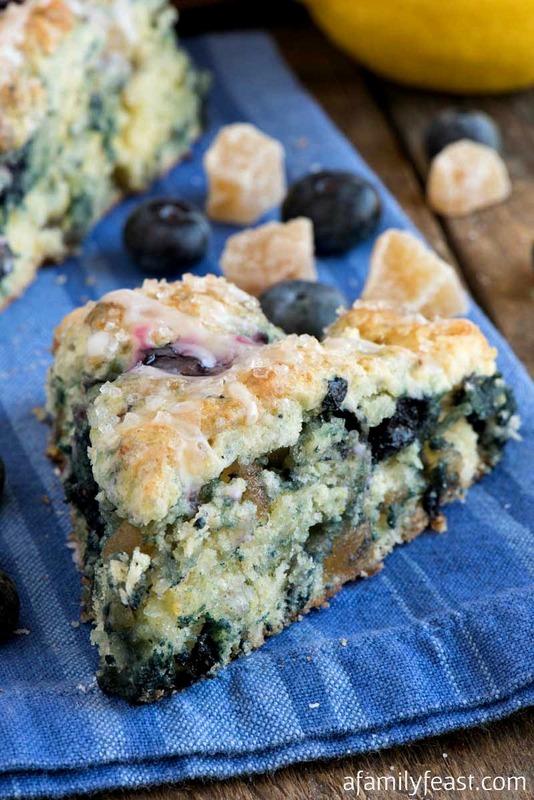 These Blueberry Ginger Lemon Scones can be made with fresh or frozen blueberries – so this bakery-style pastry can really be baked at any time of the year! 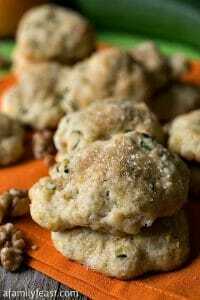 These scones are loaded with flavor! 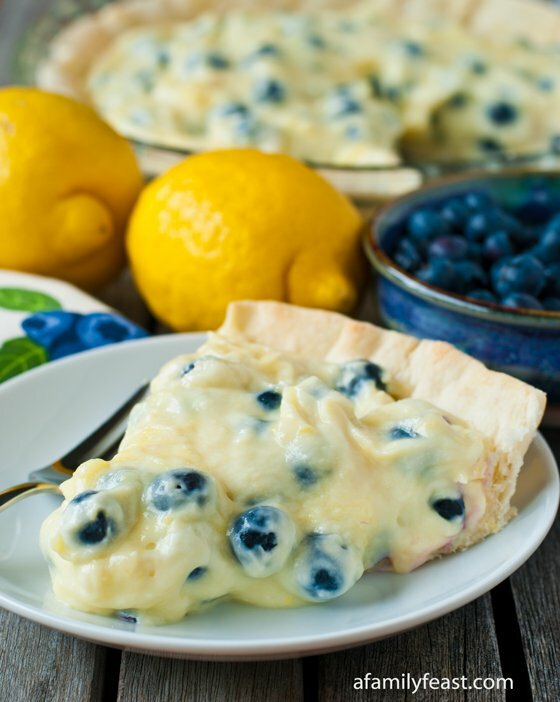 Sweet, juicy blueberries, fresh lemon zest, and chunks of crystallized ginger are nestled in every buttery, moist and tender triangle. 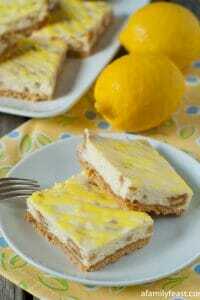 But it doesn’t stop there – you’ll taste a wonderful crunch of sweet, sparkling sugar under a sweet-tart lemon glaze. 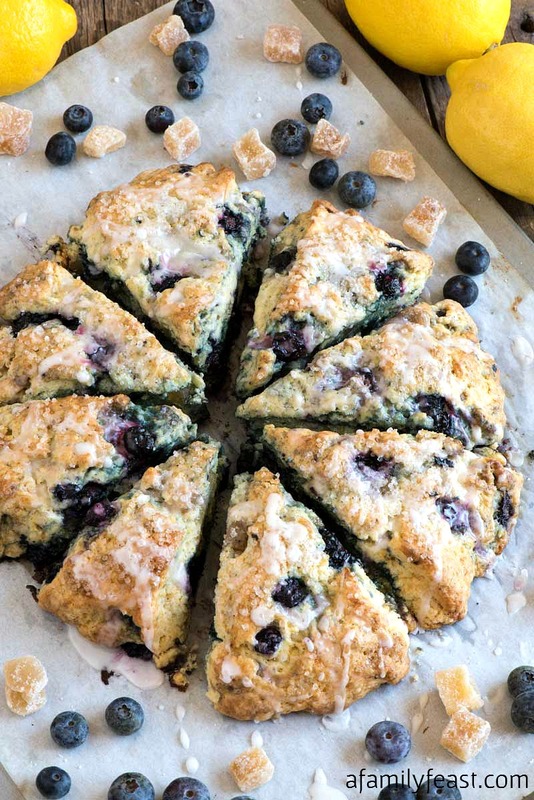 Forget about your morning jolt of caffeine – the bright flavors in every bite of these Blueberry Ginger Lemon Scones will easily (and deliciously) wake up your tastebuds! 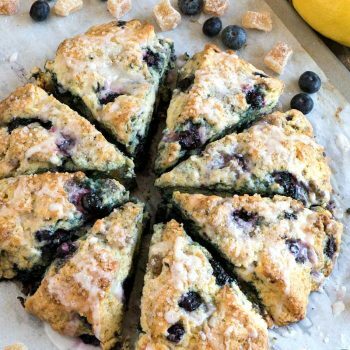 We baked these Blueberry Ginger Lemon Scones in wedges, but you could also use a half-cup measuring cup to create individual rounds of dough instead if you prefer. Preheat oven to 400 degrees F. Line a baking sheet with parchment paper. Set aside. In the bowl of an electric mixer, mix 2 cups flour, granulated sugar, baking powder, salt and lemon zest. With the mixer on low, drop in the cold pieces of butter and mix until the mixture resembles coarse crumbs. In a small bowl, whisk together ½ cup heavy cream and the eggs. Pour into the mixing bowl with the flour mixture, along with the chopped crystallized ginger, and mix just until blended but still lumpy. Toss the blueberries with the remaining 2 tablespoons flour. Then using a spatula or wooden spoon, fold the blueberries into the dough to combine and evenly mix throughout. Gather the dough with your hands, shaping it into a ball. Then place the dough onto the center of the prepared baking sheet. 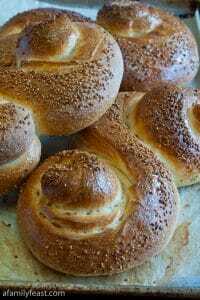 Using a rolling pin dusted with flour, gently flatten the dough into a circle about ¾” thick. 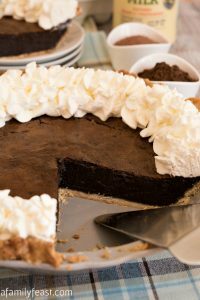 With a long knife, cut the circle of dough into 8 even wedges.Then, using a spatula and starting from the outer edge of the circle, gently loosen each wedge and pull slightly away from the center. (Once you are done with this step, you will still have a circle of 8 wedges, but there will be a little bit of space between each wedge. Brush the tops of each wedge with the remaining 1 tablespoon of heavy cream (just enough to moisten the tops) then sprinkle with the sparkling sugar. Bake for 25-30 minutes or until tops are golden and the inside of the scones are fully baked. Remove from the oven and cool for 15 minutes. Then using a knife, cut through to loosen each scone wedge. When the scones are cooled, prepare the glaze. In a small bowl, whisk together confectioner’s sugar and lemon juice. Drizzle over the cooled scones. Allow the glaze to set before serving. 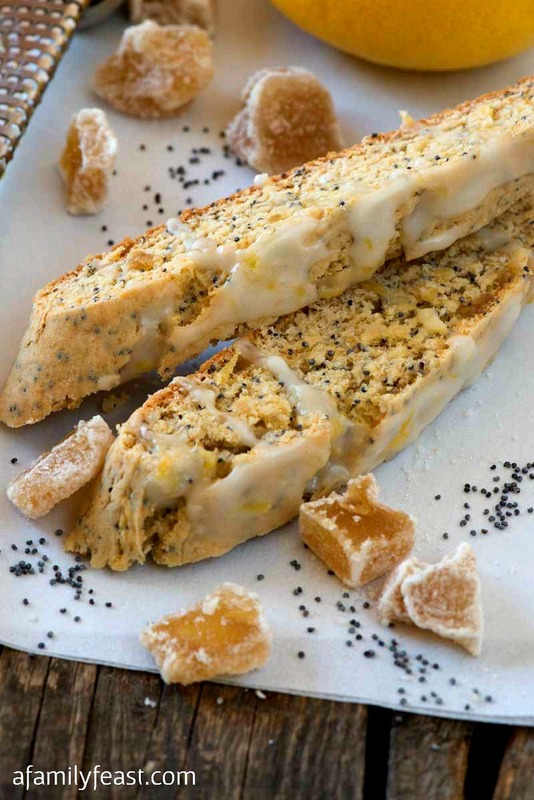 Where do you find crystalized ginger? Hi Dawn – We find it at our local supermarket – look for the larger cubes in a bag, sometimes in the spice aisle and sometimes with the baking supplies depending on the store). You might also find it among all the other small spice jars in the spice aisle – but that is typically chopped very fine and also much more expensive! (That will work but we prefer the larger chunks of ginger.) Also – you can find it on Amazon: http://amzn.to/2qMHe55. Hope that helps!